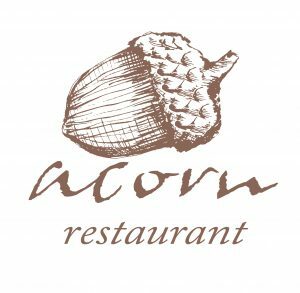 Godalming Film Festival is supported by our local sponsors! A members’ only society which celebrates film by showing films that are rarely seen on the main circuit, with an emphasis on world cinema. GFS screen ca. 20 films on most Tuesdays from September to May at the Borough Hall in Godalming. Our media partner for the festival is Vantage Point. This is a free community magazine for the Godalming (and surrounding) area. Its founder, Stefan Reynolds, has been a great supporter of the Film Festival since its inception. Bluedot Display provides full range of high quality large format printing for banners and display stands, posters, exhibition stands and conference signage. GFF are very pleased with their work in supplying the Festival with banners, tear drop banner and flyers. Mila Yoga Studio Godalming practice and teach Authentic Yoga. Your well-being is their main concern. They have a full timetable to suit everyone’s needs for challenging yourself physically or indulging in complete relaxation. The Star has been dispensing beer for some 175 years. 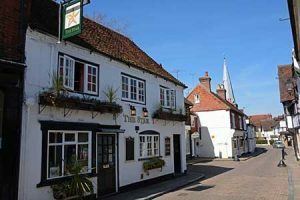 It is the only surviving “Beerhouse Act” Pub  in Godalming. 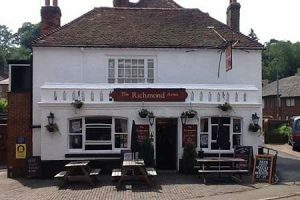 The Richmond Arms is a pub at the top end of Godalming High Street that serves food and real ales, and is full of warmth, cheer, and good service. Focal Point VR is Europe’s leading live 360 production company providing filming services to major clients in the sports, music, live events, conferences and marketing fields.  Based in Godalming, they are supplying Godalming Film Festival with equipment and technical support. Eloquent Gushing is a media network dedicated to bringing insightful content about TV shows, movies, video games, design, salt shakers, hardware, giant pits, and anything we think is worthwhile discussing. We love to look at popular culture with an in depth mindset, thinking about how it was made, why it was made that way, and where it is effective. Elstead Village Distillers. Small Batch Gin Providers – At Elstead Village Distillers, we pride ourselves in the quality of our products and our continued research and innovation into botanical infusion. Whether it be one of our classic Thundry Hills Gins or something unique, we can take your dreams to ginseption! Hogs Back Brewery Co. Brewing since 1992 – We first opened our doors on the 4th August 1992, in 18th century farm buildings that at various times have stored wheat, and housed cattle and, appropriately, hogs. The brewhouse was what is now our shop and the very first brew was TEA, which was an instant hit. The brewery is open for guided tours throughout the week so come down and give us a try. The Shutterbox is based in Godalming and we specialise in event photography. If you have people that need photographing – and especially people interacting with other people in corporate and community activities – we have the enthusiasm, experience and skills needed to capture the mood and essence of the event. Godalming Community Fridge would like to say a massive thank you to Godalming Film Society for all of their fundraising efforts. 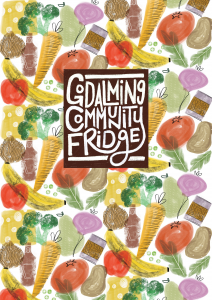 The Community Fridge is a food waste reduction project. Our amazing team of volunteers collect surplus perishable food donated by local businesses and put it in a fridge located in the Citizens Advice Bureau on Bridge Street. This food is then free for anyone to take who will use it. if you’d like to find out more you can look us up on Facebook, follow us on Instagram or come and check out the fridge for yourself. It’s open Monday to Friday from 10am until 4pm. Sam Kelly is a professional musician with more than 40 years in the business. His “Station House” band has been featuring on the U.K. music scene for many years. 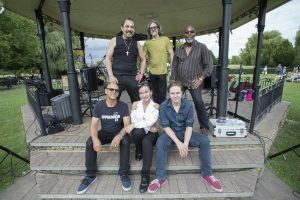 Fast forward to 2009 when Sam re-launched the band boasting a new line up of Sam Kelly (drums/bvs), Paul Jobson (MD/keys/vocals), Richard Sadler (bass), Tony Qunta (guitar/vocals) and Jerome Marcus (percussion/bvs). In 2016, a third “lead singer”, Rowena Poole, joined Sam Kelly’s Station House and this format continues to work at venues and festivals all over Europe/UK. with its roots firmly based in the blues. Finally, the Film Festival would not exist were it not for the efforts of the Festival Committee – and we had fun too!